In 2010, Udemy set out to capitalize on the growing market for video-based online education by launching a learning platform that allows anyone to teach and participate in online video classes. Yet, as the space has gotten more crowded, the startup has focused on becoming not just another online course platform, but a learning marketplace where educators of all stripes can earn compensation for sharing their knowledge on everything from front-end development to yoga. So far, it’s been working. Udemy has attracted about 400K registered students and a quarter of its approved instructors have made at least $10K from selling their courses on the site — with some even seeing six-figure earnings. With Udemy taking 30 percent of those earnings, co-founder Eren Bali recently told us that, over the last nine months, the company has seen steady 20 percent month-over-month growth. Building on this consistent growth, the startup is announcing today that it has raised $12 million in series B financing, led by Insight Venture Partners. Existing investors Lightbank Capital, MHS Capital and Learn Capital all contributed to the round, which brings Udemy’s total funding to $16 million. The co-founder tells us that the startup will be using its new injection of capital to expand the range and types of content it offers to learners, as well as fuel its upcoming push across new platforms. Alongside its new raise, Udemy is also today adding a new member to its executive team, hiring Dennis Yang as its president and COO. Prior to joining Udemy, Yang was an executive advisor to Udemy, Mogo.ca and Flipboard and held varios senior management positions at 4INFO and Good Technology, among others. While Udemy has plenty of competition from an array of video-based learning platforms and MOOCs like Khan Academy, Coursera, Udacity, Lynda.com, Skillshare and more recently Course Hero, the company has been able to maintain its growth trajectory. The startup’s platform currently offers over 5,000 courses, 400 of which were added in October alone. In addition, more than 1,500 of its courses are paid, a number that has increased 7-fold since last year, Bali told us recently. Teachers can offer their classes for free or add a paywall, with the average price for classes falling between $20 and $200. The number of students in each vary, but the most popular classes routinely see more than 500 students. Udemy’s courses are delivered on demand so that adult learners can take them at their own pace, and instructors are able to collaborate with students to build a curriculum for their students from videos, slide presentations, PDFs, documents, articles, links, photos and live conferences. Piggybacking on the disruptive market dynamics of MOOCs and other web-based learning platforms, Udemy is building a viable business, and being one of the early companies to bring the marketplace model to video-based education, its finds itself in a great position. The company recently began to partner with universities to offer leadership development solutions, and it wouldn’t be surprising to see Udemy continue to begin more aggressively pursuing B2B offerings, like enterprise training or education solutions for employers. 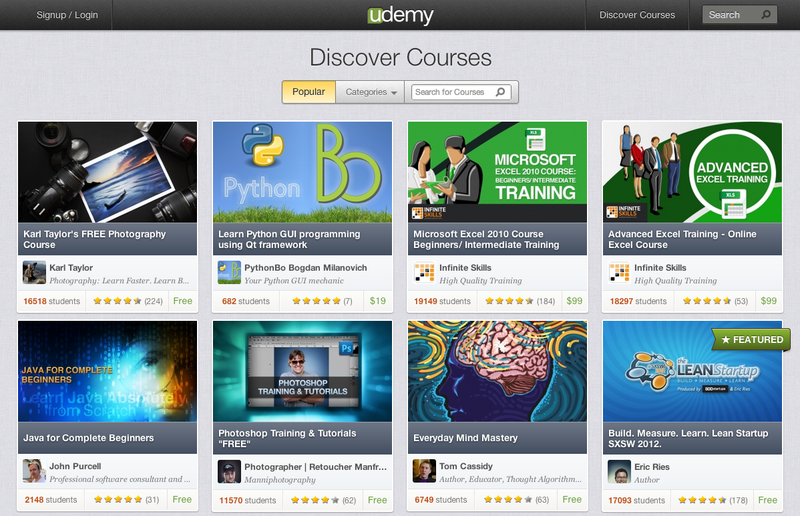 More on Udemy at home here or in our recent coverage of the company’s new course creation platform for teachers.